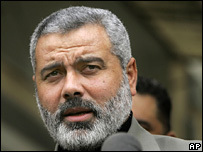 The political leader of Hamas is the terrorist Ismail Haniya. He ran the Hamas security wing whose job was the murder of Palestinians it viewed as collaborators with Israel. He was the main assistant to the terrorist Sheikh Ahmad Yassin. Just before the January 25, 2006 Palestinian election, he made the following statements. We therefore explore the key words Ismail, Haniya, and Hamas. 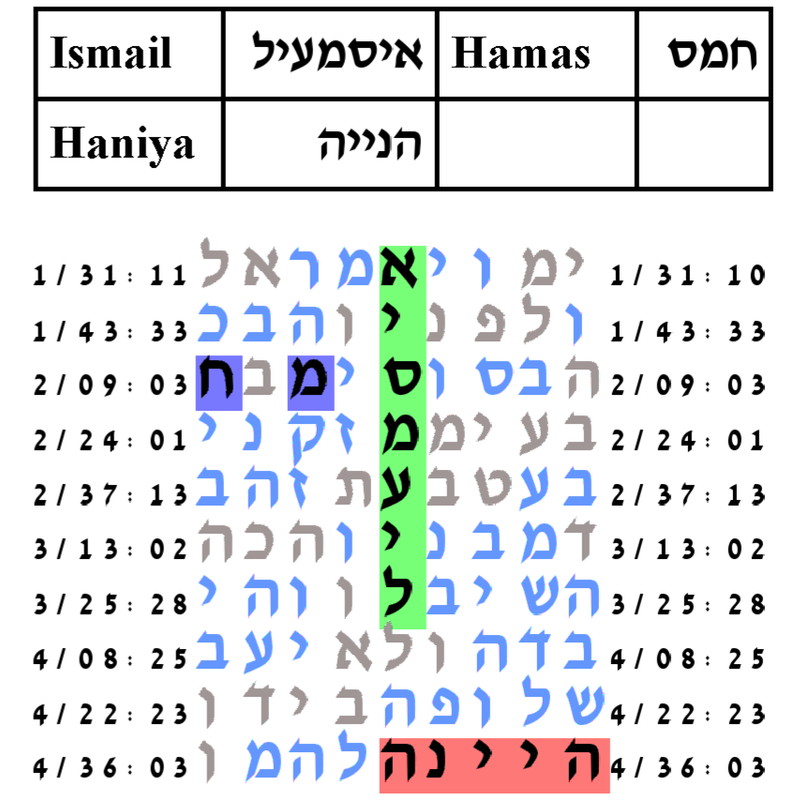 The name Haniya can be spelled either as הניה or הנייה. We explore both spellings. With the spelling הניה and the expected number of ELSs set to 100, the probability that a text from the ELS random placement text population would have as area compact table as that produced by the Torah text is 253.5/1,000. 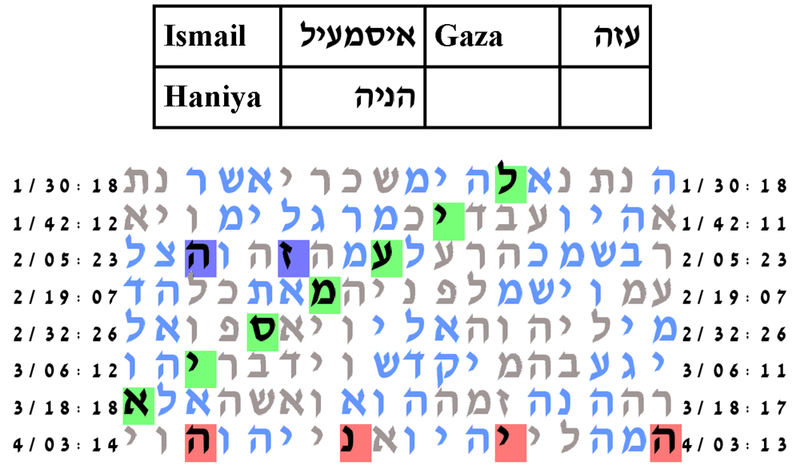 With the spelling הנייה and the expected number of ELSs set to 20, the probability that a text from the ELS random placement text population would have as area compact table as that produced by the Torah text is 4.5/1,000. The expected number of ELSs is set to 100. The cylinder size is 9427 columns. The probability that a text from the ELS random placement text population would produce as small a table as this is 253.5/1,000. The expected number of ELSs is set to 20. The cylinder size is 22,800 columns. The probability that a text from the ELS random placement text population would produce as small a table as this is 3.5/1,000. Rabbi Glazerson suggested that instead of exploring just Haniya, we explore the key word phrase Chief Haniya, chief or general being the designation applied to a leader of a militant group. With the expected number of ELSs set to 100, the probability that a text from the ELS random placement text population would produce as small a table as that produced by the Torah text is 27.5/1,000. The expected number of ELSs is set to 100. The cylinder size is 1,163 columns. The probability that a text from the ELS random placement text population would produce as small a table as this is 27.5/1,000. From June 12 throrgh June 14, 2006 Hamas made a military coup and took over the Gaza strip. Therefore, it is reasonable to explore putting together Ismail Haniya with Gaza. With neither spelling of Haniyah were the best tables in the Torah text statistically significant. The expected number of ELSs is set to 100. The cylinder size is 21,229 columns. The probability that a text from the ELS random placement text population would produce as small a table as this is 134/1,000. The expected number of ELSs is set to 100. The cylinder size is 1163 columns. The probability that a text from the ELS random placement text population would produce as small a table as this is 205/1,000. As before, Rabbi Glazerson suggested that instead of exploring just Haniya, we explore the key word phrase Chief Haniya. With the expected number of ELSs set to 100, the probability that a text from the ELS random placement text population would produce as small a table as that produced by the Torah text is 19/1,000. The expected number of ELSs is set to 100. The cylinder size is 1163 columns. The probability that a text from the ELS random placement text population would produce as small a table as this is 19/1,000. We thought to explore combining Haniya, Gaza, and Hamas. With the expected number of ELSs set to 75, the probability that a text from the ELS random placement text population would produce as small a table as that produced by the Torah text is 21.5/1,000. The expected number of ELSs is set to 75. The cylinder size is 4 columns. The probability that a text from the ELS random placement text population would produce as small a table as this is 21.5/1,000.